Started blogging! Yes, I have the most incredibly exciting life. We don't have any. Sad, but true. We do have a copy of a famous Danish painting of fishermen. CH's great-great grandfather is one of the fishermen. To see the painting, click here. The painting is on the right side of the screen. 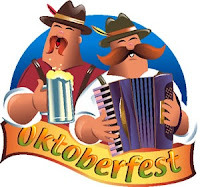 Oktoberfest. The real one in Germany. I love snow. Especially when we don't have school. There's just something about the disruption of the schedule, drinking hot chocolate, and the peacefulness of it all. 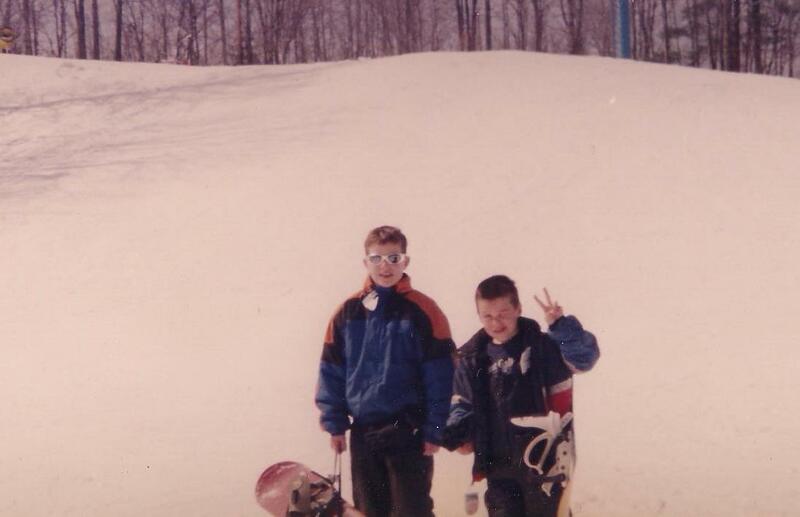 I tried to ski once while on a high school trip to Minnesota. I never got off of the bunny slope. We had this one guy who had never skied, but he went up to intermediate slope anyway. We watched him ski, fall, ski, fall, all the way down to the bottom. By the end of the day he was skiing all the way down. CH, OS, & MS ski & snowboard. YS has skied a couple of times. Me? I don't like the feeling of not having any control...I'm a control-freak, remember? Patience. CH has been very patient throughout our married life! I don't have just one. There's my bed, which I absolutely love, especially in the winter. I love having the down comforter over me during those cold nights. Then there's the living room couch. There's nothing like curling up on the couch with a blanket over me, watching old movies while the Christmas tree lights are the only lights on. Love it. And, the kitchen when we have a fire going in the fireplace. Our house is kind of weird in that we have 2 fireplaces: one in the kitchen and one downstairs in the "man cave". But, it's in a weird spot down there. I'm just amazed that Christmas started before Thanksgiving. I just thought it was ridiculous this year; it seems like everything started earlier. The sales started before Thanksgiving, and even the Christmas specials on tv started early. One of my friends' son (who is 8 years old) told her that I need outside lights. I told her that I would work on it, but it wasn't Thanksgiving yet, and our 49 year old house doesn't have outside outlets. My decorations won't go up for another week (after high school football season is over), but they'll stay up until Epiphany (the real end of the Christmas season), which is January 6th this year. So, the decorations will probably stay up until January 8th. When will your Christmas decorations come down? I agree Mary - I thought the same thing everything happened much quicker with the holidays! Most people on my street have their lights outside already up and they are on. We'll probably leave our decorations up until Ephiphany too. We're traveling over the holidays so I want more time to enjoy. I'm like you and love sitting in our family room with just the tree lights on. I agree with you it just seems that the retail business is trying to do away with Thanksgiving. Christmas comes fast enough lets not rush it but enjoy and savor it. I have to agree with you on the bed being the coziest spot. It's definitely mine! Girl, I am with you on the whole Christmas before Thanskgiving thing. I will say that I had my house decorated the week before Thanksgiving, and for the most part, I've always done this. BUT, I never, ever turned on my lights until the day AFTER Thanksgiving. I made this a firm rule despite whatever pleading my children did. I leave our tree and all the decorations up until Epiphany too! I have a friend that starts taking her tree down the day after christmas, I think that's crazy! I cannot put my tree or decor up any earlier than the Saturday (usually) after Thanksgiving. Sometimes it is up well after January has began but never put up before Thanksgiving. To me Thanksgiving just doesn't seem the same with a Christmas tree and decor up. I'm with you on the down..although I do not have a down comforter..just a blanket but it is the best blanket we ever had! Also with you on decorations. I only put up some Advent things. Growing up, real trees only, we didn't put our tree up until maybe one week prior to Christmas day and left them up till Three Kings Day. Just heard a priest say the other day that Christmas season doesn't begin until the 25th and it is a shame to see trees on the curbside by mid-afternoon Christmas day...waiting for the trash pickup. That control thing is why I don't ski, too! I guess if I really knew what I was doing, I would be in control--but I can't take that chance. that would be fun to go to the Oktoberfest in Germany! I'm with you about snow, pretty to watch and fun to have a snow day (but we never had them in Montana, they don't ever close the schools when it snows), just not fond of driving in it. Also with you about skiing, my son and hubby would ski, I enjoyed the lodge next to the warm fire!! Snow days. I miss snow days. Glad to read others are just as annoyed by the xmas rush. I enjoyed reading your answers. I think it must be a race each year to see who is first! I like your blog decorations. I have tried several snows and they won't work on my blog. The scrolling things don't work either. Hope your having a nice weekend.